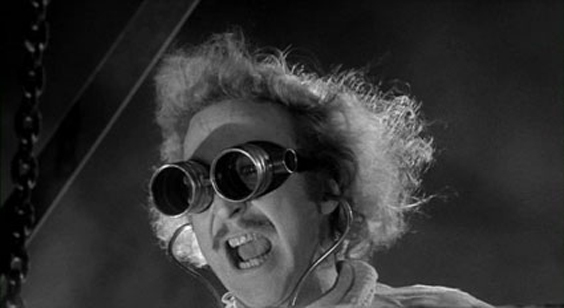 Above, a frustrated Gene Wilder gives up on muzzleloading, opting instead to create life in "Young Frankenstein." 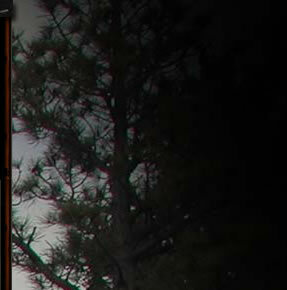 Muzzleloading hunting has never been easier, more effective, or more hassle-free. You might not think that from some of the some of the embarrassingly strange sets of hunting regulations out there, but that's a story for another day. Why muzzleload in the first place? You'll enjoy access to far more hunting seasons, you'll have greater range and accuracy than possible with slug guns, at a lower cost per shot. If you want your name in the record book, the Longhunter's Society Record Book (http://www.nmlra.org/longhunter.asp) and others are comparatively wide open. Rather than becoming reliant on what factories shove into a cartridge, you get to decide what is appropriate for your needs. There is no better way to teach and learn all the basics of firearm operation, from ignition to propellant to projectile. It is the exact opposite of spray and pray, it is one shot and make it a good one. There is no better way to introduce your kids to hunting. Above, specially trained horses unleash a massive amount of kinetic energy and a give a shockingly vivid demonstration of "energy dump." Kinetic energy numbers alone are essentially meaningless; and KE may indeed be harmless . . . even at close range. The truth isn't always marketable and there are some still mired in terms of energy and expansion worship. Hal does a fabulous job of dispelling the common mythology surrounding wounding ballistics at http://www.rathcoombe.net/sci-tech/ballistics/myths.html . If you think that energy transfer, stopping power, and knock-down have great meaning outside of comic books and gun catalogs, he makes it easy to understand that it doesn't. The short version is that large diameter bullets don't shrink, there is no substitute for shot placement, and there is no big game animal in the world that can survive for long with a half inch hole through their vitals. The use of kinetic energy as any reliable barometer of lethality is very close to void of meaning. Colonel Townsend Whelen was well aware of this back in The Hunting Rifle (1940) when he wrote, "The killing power of a bullet in flight depends entirely upon the average size of the wound it makes in the animal, and upon nothing else. The size of the wound in turn depends upon the size, weight, construction, and shape of the bullet, and the velocity with which it strikes, and upon no other details." 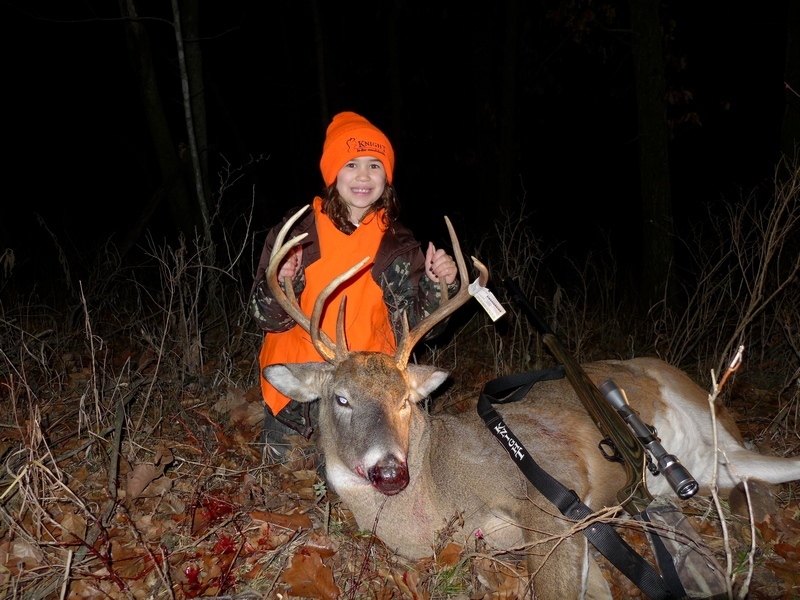 Eight year old Grace Knight poses with her first deer taken in late 2012. Over the last twenty-five years, only a handful of muzzleloading rifles have been truly significant. The Knight MK-85 from Tony Knight, the Thompson-Center Omega, and the Savage 10ML-II would be the most significant three in my view. Today, the muzzleloading selection is relatively sparse. There has been the regrettable fodder from Dikar S. Coop, part of Mondragon. Most Mondragon shooters have no idea that they are shooting a Mondragon, or even a Dikar for that matter. The other nasty collection is from Ardesa, although that as well seems to be a secret of sorts. Both organizations have tragically lamentable track records; you are likely more familiar with what they are branded as in the U.S.: CVA and Traditions. While as common as Bic lighters and usually made almost as well, those are the brands to stay away from as far as I'm concerned, unless you are a personal injury attorney. The sport of muzzleloading has been in a bit of a slumber over the past few years. It seems that championing the joy and challenge of the sport has been largely lost, in favor of just selling boxes. Once the top company in the game, Knight Rifles, was eventually run into the ground by the parent corporation that controlled it, EBSCO, with part of the finale including a puzzling release of poorly thought-out rifles such as the Revolution, Knight Vison, and the Knight Shadow. Savage decided to discontinue their 10ML-II in late 2012. Thompson Center Arms, the leader in muzzleloading after the fall of Knight, was unfortunately acquired by Smith & Wesson. The lay-offs at T/C in Rochester, New Hampshire began shortly thereafter. Finally, S & W idled the plant, shipping some of the tooling and only a handful of employees to Springfield, Massachusetts. Apparently, S & W has already discontinued T/C sidelocks and has no intention of promoting T/C muzzleloaders. I've hunted with Knight, Savage, and T/C muzzleloaders extensively over the years. T/C Omega and T/C Encores from Rochester have been very good performers for me. What exactly S & W is shipping presently is unknown. US Patent #6604311 was filed for on October 12, 2002, and awarded on August 12, 2003. It is for a Lever-operated breechblock for muzzle-loading firearm. You might wonder what this patent has to do with anything? Well, it concerns the T/C Omega and is by Mark Laney, Karl Ricker, and Gordon Cate of New Hampshire. Mark Laney is the inventor associated with a large number of T/C patents. That brings us to LHR Sporting Arms, founded in New Hampshire in May 2012. The L is for Mark Laney, the R is for Karl Ricker and that should tell you in part why the new LHR Redemption appears to be the real deal. For the time being, the T/C Omega and the T/C Encore would be the two muzzle-loaders I'd be most comfortable in recommending that are in current production, with the LHR Redemption looking very promising. 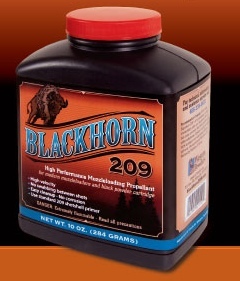 Blackhorn 209 is the most consistent inline muzzleloading propellant ever released. No crud ring, no swabbing, low corrosivity, easy clean-up with a couple of patches of Hoppe's No. 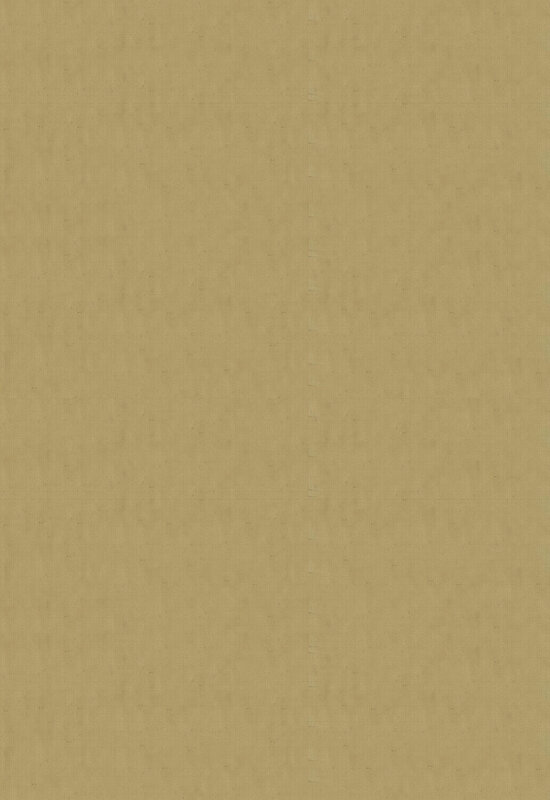 9 or similar. Measured by blackpowder volumetric measure or by weight, you'll get great results either way. Premeasuring propellant by weight is invariably the best method. You have a huge variety of choices, so I'll give you one basic example loaded to 2000 fps: the Parker Ballistic Extreme 275 grain. I'm using a static B.C. of .260, your results will vary based on your rifle, ambient conditions, etc. Use of a Spinjag makes loading saboted bullets comparatively smooth and easy with little chance of canting the bullet. These representative ballistics assume a 3 inch high sight-in at 100 yards: that yields a 163 yard zero and a 6 inch kill zone Point Blank range of 192 yards. While gravity is wonderfully repeatable, the wind that we can't see is not. Note that at 250 yards, just a 10 mph crosswind nets close to 14 inches of wind drift. The "best load," the bullet / sabot combination that your individual rifle prefers, is something that only you can determine, just as in all firearms. It is always a good idea to get that one sorted out well in advance as opposed to a few weeks before the season opener. I've had excellent reults with the Barnes T-EZ 290 grain Flat Base, Bob Parker just came out with his 300 grain Ballistic Extreme in 2012 that is prettier than a speckled puppy under a red wagon, and the flattest shooting 300 grain bullet on the market is the Parker Match/Hunter. Bullets aren't remotely equal in performance. 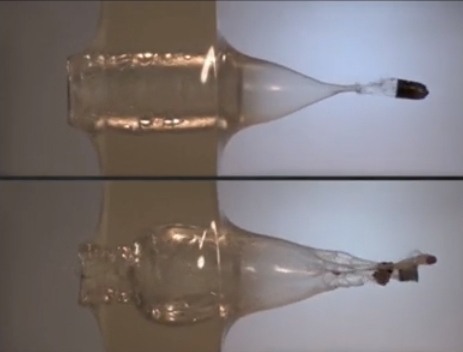 The uppermost bullet, a Powerbelt, zips through ballistic gelatin at 100 yard strike velocity with no visible deformation and sadly little tissue disruption. 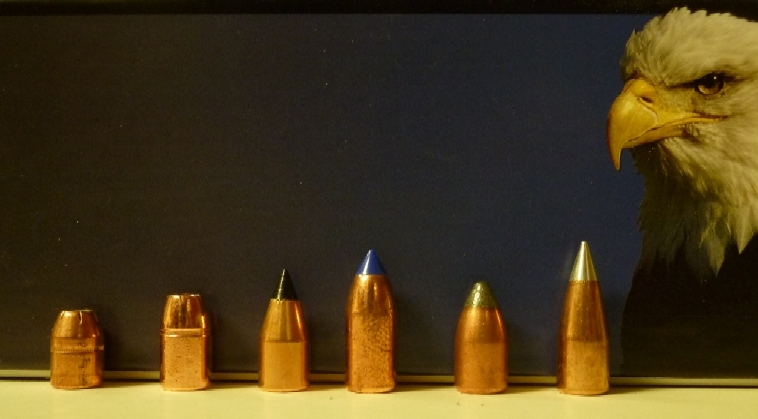 As a miserable bonus, bore size bullets fly very poorly compared to their saboted counterparts. The lower bullet, apparently a T/C Shockwave / SST, has already popped its core and is starting to fragment. Both are examples of types of projectiles to generally avoid. Two holes are always better than one, as far as I'm concerned. There is certainly nothing wrong with expansion, as far as additional cavitation that's a very good thing. But, never at the expense of inadequate penetration for that can mean trouble. As a generalization, for a bullet to group tightly it must also load firmly. A .004 - .005 interference fit between dressed sabot and your bore is ideal. A muzzleloading scope is indistinguishable from a riflescope: that's all it is. 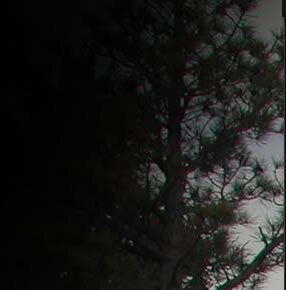 The scope you choose is contingent on the ranges you want to hunt at, your reticle preference, and how much you want to invest in your optics. The most important thing a scope can do is hold its zero. If it doesn't do that, everything else is a waste of time. For the $200 category, little can compete with a Burris Fullfield E1 3  9 x 40. If you are willing to put a bit more into your optics, I've been favorably impressed with the Minox ZA5 2-10 x 40, and two 30mm illuminated reticle scopes: the Hawke Optics 3-12 x 50 Endurance 30 and the Leupold 3-9x40 VX-R 30mm. Though not exactly a graceful looking scope, the Burris Eliminator II laserscope now works at all magnifications, handles muzzleloading ballistics, and will let you hit reliably to 400 yards or so if you are very careful to take wind drift into consideration. If you hunt where no magnification is allowed, the Aimpoint H34S is top of the line. 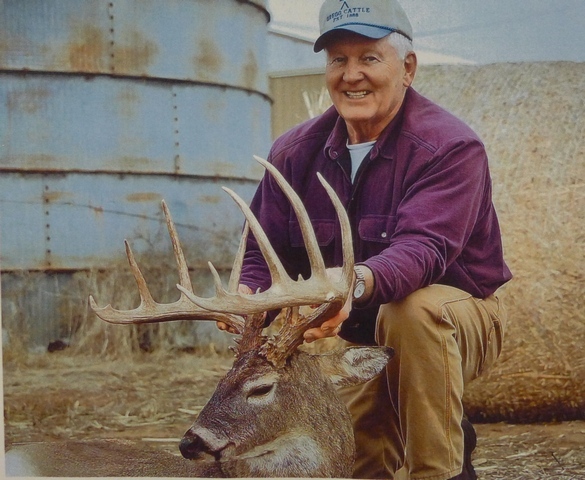 Art Seaman of Cadillac, Michigan, has this habit of finding monster bucks. Art used a 300 grain Parker Match/Hunter to take this trophy with his Savage 10ML-II on December 6, 2012. This trophy is between 170 - 193 Boone & Crockett.